My university friends and I went to eat at Nazareth for Ethiopian food after walking around Bloor St. W on the last Sunday of the year. Nazareth Restaurant is quite dark, small and cozy. There aren’t alot of tables there so get there early to avoid the line! A word of warning, the washrooms are in the basement, down a flight of stairs, and the ceiling is not for anybody taller than 5’5 or 165cm. We had the vegetarian platter ($10) and the tibs ($12). We were each given a plate of injera bread. Injera is like roti/chapatti, dosa, paratha, and/or naan in that they are all flatbreads however injera is more sponge-like and is much softer and not as course as Indian flatbread. It is also not as crunchy as Indian flatbread. The way you eat Ethiopean food is similar to the way you would eat Indian food. There are no utensils so you would first wash your hands. 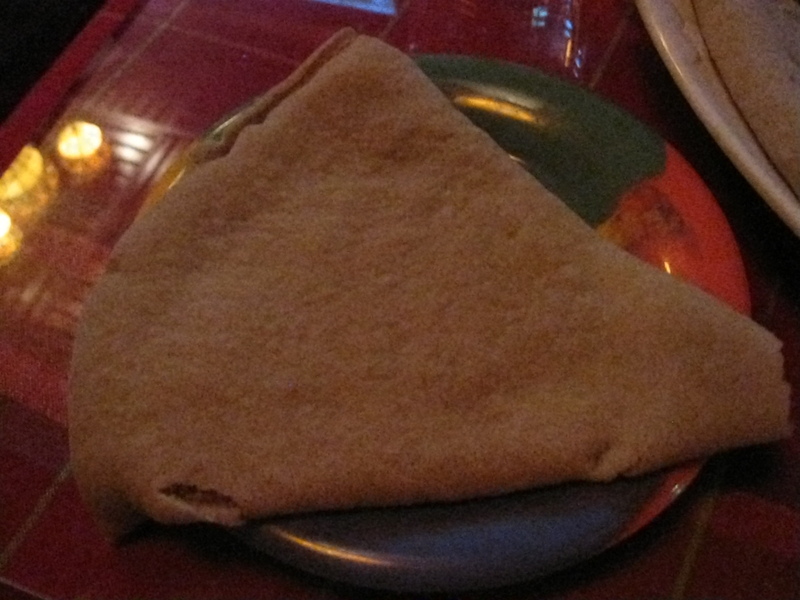 You then rip the large piece of injera into a small piece and use that to pick up the food and you would eat it. You’re given a pitcher of water as well. 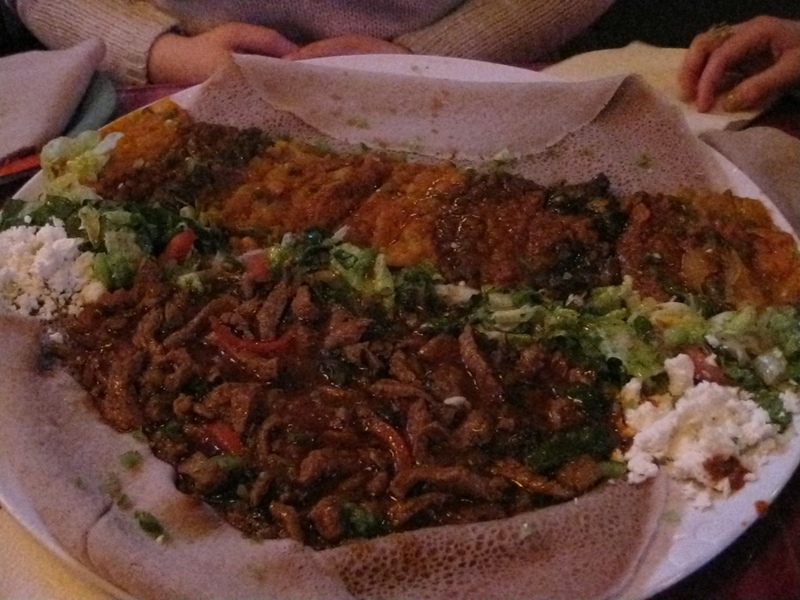 The vegetarian platter and tibs were served on the same plate and on top of a large piece of injera. My friends both enjoyed it however one of my friends found the tibs slightly too spicy for her. I found the dishes to be perfectly delicious and not too spicy. The vegetarian platter is basically a combination of a variety of vegetable dishes eaten in Ethiopia. The vegetarian platter includes feta cheese, salad, collard greens, amongst other Ethiopian vegetarian dishes. Tibs is pieces of beef sauteed in seasoned butter, onions and peppers. Overall, if you’re close to Koreatown, Little Italy, Bloordale or Dufferin Grove and craving good, cheap Ethiopian food then Nazareth Restaurant is the place to go to.